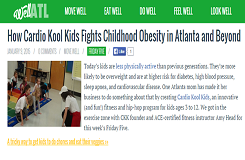 Cardio Kool Kids™ | Creating Healthy Kids for a Lifetime! Cardio Kool Kids at Wood Acres is a complete wellness curriculum for children ages 4 through 1st grade that innovatively combines sports, dance, and health education. Cardio Kool Kids was created by Cobb parent Amy Head, using a holistic approach to consider the physical, emotional, and mental well-being of children. Amy combines her professional expertise as a Licensed Clinical Social Worker and as an ACE Certified Fitness Instructor and certified ZUMBA Instructor to develop the curriculum which is used in schools, recreation centers, and other settings. I hereby agree to release and hold harmless The Wood Acres School, its officers, trustees, and representatives and Cardio Kool Kids, its employees and representatives, from any responsibility, loss, liability, damage or costs which Participant may incur in this after school program whether caused by the negligence of The Wood Acres School and/or Cardio Kool Kids, the negligence of Participant and/or others, or due to accidental occurrences. In the case of injury or medical emergency involving Participant, if a parent or guardian cannot be reached, I give the Cardio Kool Kids program representative(s) permission to seek appropriate first aid or medical care and I agree to be fully responsible for the cost of any services provided.